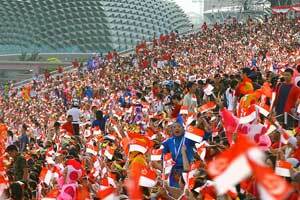 Singapore National Day celebrates the Independence from Malaysia on August 9 1965. People will attend national pride parades particularly the parade held at the Marina Bay where the Prime Minister will have a speech followed by fireworks. Parades will include the military, police and other government and union workers all celebrating Singapore as a nation. In 1965 Malaysia broke up into smaller nations which gave birth to the Singapore nation. Today the event is celebrated as Singapore National Day.